William Dafoe grew up in Appleton, Wisconsin, about 100 miles north of Milwaukee, and was nicknamed "Willem" in high school. He was expelled from Appleton East High School for making a video that school administrators deemed pornographic. 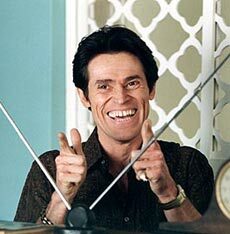 To get his diploma, Dafoe finished his studies at nearby Lawrence University. He studied drama at the University of Milwaukee, but soon dropped out, deciding he could learn more as an actor. Dafoe joined that city's experimental Theater X, and toured with them for two years before moving to New York in 1977. He was a founding member of the Wooster Group, an off-Broadway venture that survives to this day. Before his breakthrough in To Live and Die in L.A., Dafoe's film roles were mostly tiny, and usually had him playing oddballs and bad guys. It was off-casting to have him play the embodiment of Good in Oliver Stone's allegorical Platoon, opposite handsome Tom Berenger as Evil. The gamble paid off, with Berenger, Dafoe, and the film all nominated for Oscars. When movies aren't enough to occupy his time or mind, Dafoe still appears occasionally in the Wooster Group's stage productions, such as LSD and The Hairy Ape.